Some researchers see the Horse as representing the Celtic horse goddess Epona, who was worshipped as a protector of horses, and also had associations with fertility. However, the cult Epona was imported from Gaul (France) probably in the first century AD, which is when we find the first depictions of the horse goddess. This date is at least six centuries after the Uffington horse was carved. Nevertheless, the horse was of great ritual and economic importance during the Bronze and Iron Ages, as attested by its depictions on jewelery, coins and other metal objects. Perhaps the carving represents a native British horse-goddess, such as Rhiannon, described in later Welsh mythology as a beautiful woman dressed in gold and riding a white horse. Others, however, see the White Horse as connected with the worship of Belinos or Belinus, ‘the shining one’, a Celtic sun god often associated with horses. Bronze and Iron Age sun chariots, mythological representations of the sun in a chariot, were shown as being pulled by horses, as can be seen from the 14th century BC example from Trundholm in Denmark. If, as is now believed, the Celts were settled in Britain at the latest by the end of the Bronze Age, then the White Horse could still be interpreted as a Celtic horse-goddess symbol. There are some who believe that the great carving does not represent a horse at all but a dragon. 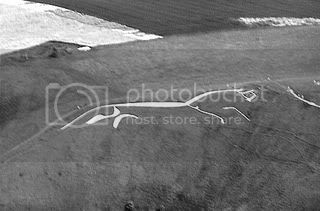 A legend connected with Dragon Hill, a low natural flat-topped mound situated in the valley below the White Horse, suggests that the Horse depicts the mythical dragon slain by St. George on that hill. The blood of the dying dragon was supposed to have been spilled on Dragon Hill, leaving a bare white chalk scar where to this day no grass will grow. Perhaps the St. George connection with the White Horse is a confused memory of some strange prehistoric ritual performed on Dragon Hill by its creators, perhaps as long as three thousand years ago. Up until the late 19th century the White Horse was scoured every year, as part of a two day Midsummer country fair, which also included traditional games and merrymaking. Nowadays the accompanying festival has gone and the task of maintaining the Horse is undertaken by English Heritage, the organisation responsible for the site, the last scouring taking place on June 24, 2000. Why were Hill Figures Created? The reasons for the creation of these hillfigures are probably as varied as the figures represented. New archaeological and geological evidence is increasingly indicating a medieval date for the giant naked human figures, which some historians have argued were products of an age of civil war and extreme political turmoil in England, when satire was sometimes the only weapon. Compared to the huge stone permanence of structures like the Avebury Monuments and Stonehenge, hill figures are much more transitory, ten or twenty years without scouring and the carving could be lost forever. The fact that the figures could disappear so easily, along with their associated rituals and meaning, indicates that they were never intended to be anything more than temporary gestures, which have only survived either by accident, or in the case of the White Horse of Uffington, by the continued existence of extraordinary tenacious local tradition. But this does not lesson their importance. These giant carvings are a fascinating glimpse into the lives and minds of their creators and how they viewed the landscape in which they lived. In June 2010 vandals sprayed part of the White Horse with purple paint. A banner that read ‘fathers 4 justice stop the secret family courts’ was recovered from the site by police, although the Fathers 4 Justice organization denied any connection with the senseless act. Fortunately, the monument was restored by National Trust workers soon afterwards, and at least one has the satisfaction of knowing that the White Horse will still be galloping across the Berkshire Downs long after those responsible for the vandalism are laid under the sod. Castledon, R. Ancient Hill Figures of Britain. Seaford, SB Publications. 1999. Newman, P. The Lost Gods of Albion: The Chalk Hill-Figures of Britain. Sutton Publishing Ltd. 1997. James, P & Thorpe, N. Ancient Mysteries. Ballantine Books. 1999. Westwood, J. (ed) The Atlas of Mysterious Places. Guild. 1987.